Introducing the Cromar Leadax - Second Generation Lead Alternative Roller – the only tool of its type you’ll ever need to get the job done! If you’re tired of searching around for a good deal, you’ve come to the right place. Here at JJ Roofing, we are the leading stockist and supplier of roofing products to both homeowners and professionals. 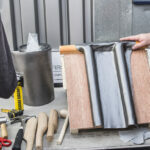 The Cromar Leadax - Second Generation Lead Alternative Roller is a tool uniquely designed to mould Leadax around roof tiles or details that can be a little difficult to manage with other tools. It has been designed with intuitiveness in mind and it is, without a doubt, one of the simplest tools available. No special training is required and within no time you’ll be producing professional quality results. What makes the Cromar Leadax - Second Generation Lead Alternative Roller stand apart from its competitors is that it is specially designed to work in tandem with lead alternative roofing materials. Leadax lead-alternatives are among the only materials in the world that boast the same properties as traditional lead. That’s right; all the benefits of lead without any of the drawbacks! What are the drawbacks you ask? Well, Leadax lead-alternative products are non-harmful to the environment as they are not made using traditional lead. They are also a lot safer for your overall health too. The Cromar Leadax – Second Generation Lead Alternative Roller is easier to use, versatile, durable and affordable. Best of all is that it is suited for a wide range of purposes. Each one has been made without any compromise to quality. Every Cromar Leadax - Second Generation Lead Alternative Roller is BBA certified too making it the perfect accessory for both homeowners and professional roofers alike. Order your Cromar Leadax - Second Generation Lead Alternative Roller today from JJ Roofing and you’ll enjoy a price that is most affordable. All prices are inclusive, and exclusive of VAT for your convenience. Plus, when you order from us, you’ll receive a delivery estimate of 3-5 working days.